Today business moves faster than ever before. Teams are more fluid, projects are more dynamic and skills are in more demand. To stay competitive, companies need a workforce that is responsive, agile, speedy, flexible and customer-focused. As a result, Human Capital leaders are on a transformational journey. It’s not enough for companies to give someone a job, they need to provide employees an optimized, connected experience so they can perform their best. 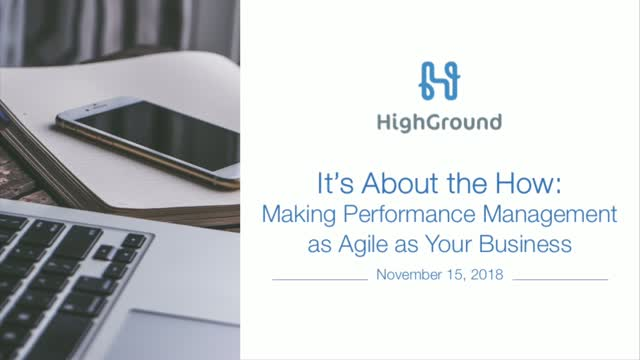 After this webinar, attendees will have a better understanding of the trends driving the performance management transformation as well as a real world example of how one company actually made the change. Fancy employee perks. Employee wellness programs. Rewards and recognition — you name it, there's no shortage of initiatives to improve the employee experience. But many of these efforts are falling flat. There has been a shift in employee engagement, and companies with an outdated Employee Experience are missing the mark. It's time to look at engagement from the bottom-up and build a culture that drives results. With unemployment near record lows, companies are competing fiercely for skilled employees. Retention should be top of mind for every company looking to keep their top talent — if it isn't already. Join YouEarnedIt and HighGround for this 45-minute webinar covering 5 tried-and-true ways to boost retention in today's workplace, pulled from the latest industry research and our firsthand experience helping hundreds of organizations. Boost engagement with recognition, rewards and performance management. For years, YouEarnedIt and Highground have delivered real-time recognition, meaningful employee rewards, and performance management solutions that drive employee engagement and bottom-line business results. Here, you'll find our latest research-backed information and proven advice from our customers and employee experience experts.